The following includes news articles and publications relevant to the IBH priorities and ongoing drug policy discussions. Join leaders in drug policy, treatment, prevention and recovery from around the world for Think Globally, Act Locally: A Global Drug Policy Summit on June 26, 2019 in Phoenix, Arizona. The Institute for Behavior and Health is pleased to organize this exciting event with the World Federation Against Drugs (WFAD), Smart Approaches to Marijuana (SAM) and Drug Free America Foundation (DFAF). Attendees can choose from two engaging policy tracks including “International Drug Policy Perspectives and Innovations” and “Local and National Impacts of Changing Marijuana Policy.” Learn more and register today! Addiction Policy Forum, a nationwide non-profit organization dedicated to eliminating addiction as a major health problem, released a letter from families as part of the #192aDay awareness campaign to honor those lost to drug overdose and other complications of substance use. In their letter, families explain, “This letter to you is about the things we wish we had known — the things we’ve learned since we suffered our losses and wish we had done differently.” From learning the signs of a problem to paying attention to early substance use, to finding quality treatment and finding support, these hard-learned lessons can help other families across the country facing addiction. Read more. March 18, 2019: Lindesmith and Bejerot - Could They Meet Today? The antagonists in the drug policy field, Alfred Lindesmith and Nils Bejerot, made completely different conclusions in the past. Could they have agreed today? IBH President Robert L. DuPont, MD presents an analysis in DrugNews. After reviewing this history, he notes, “Bejerot saw clearly the risks of compromising with drug use and the value of labeling this use as unhealthy and unacceptable. Sweden provides a model for the world in drug policy today.” Read more. IBH President Robert L. DuPont, MD served as the plenary speaker at the 7th Annual Southeastern US Regional Drug Prevention Summit. Following his presentation, he was interviewed by The Addiction Podcast - Point of No Return, reviewing his work in the field of addiction treatment and national drug policy and advocating for renewed focus on youth prevention and defining the goal of substance use disorder treatment as long-term recovery. The 50th edition of Recovery Magazine features an interview of IBH President Robert L. DuPont, MD who discusses his work in the field of addiction, the miracle of recovery he has witnessed among his patients and his book Chemical Slavery. Recovery Magazine is free to download with embedded audio link to the interview. IBH President Robert L. DuPont, MD and IBH Vice President Caroline DuPont, MD are honored to serve on the Addiction Policy Forum’s Scientific Advisory Board to provide strategic guidance and direction for research and scientific programs. APF is a leading national non-profit organization dedicated to eliminating addiction as a major health problem. Read more. A commentary in the LA Times highlights the Institute for Behavior and Health’s One Choice prevention message: no use of any alcohol, nicotine, marijuana or other drugs for youth under age 21 for reasons of health. At the core of this message is the brain science showing that the rapidly developing adolescent brain is uniquely vulnerable to drugs. Authors Paul Larkin Jr. and Stephanie Zawada note, “Brain health is critical to the pursuit of happiness. And leveraging scientifically accurate presentations and testimonies to convince young Americans to prioritize their own brain health early on can prevent future substance abuse. Read more. In two op-eds, one in The Wall Street Journal and the other in The New York Times, author Alex Berenson highlights the growing support for marijuana legalization has been fueled by misinformation about a drug that is not harmless as its advocates suggest. He notes that “as marijuana use has become more socially acceptable, psychiatrists and epidemiologists have reached a consensus that it presents more serious risks than most people realize.” There are clear connections between marijuana use, psychosis and violence. Although“legalization hasn’t led to a big increase in Americans trying the drug, it has meant that those people who already use it do so far more frequently. In 2005, about three million Americans used cannabis every day. Today, the figure is eight million. Put another way, about one cannabis user in five uses it daily. By contrast, only one in every 15 drinkers, about 12 million Americans, consumes alcohol every day.” The dramatic increase in heavy use is just one of many causes for serious public health concern as the legalization and normalization of marijuana continues. Read more in the WSJ and the NYT. The latest data from the nationally representative Monitoring the Future study shows the single-largest year-to-year increase in substance use in the US for 10th and 12th graders due to vaping. From 2017 to 2018 past-month vaping of nicotine nearly doubled among high school seniors from 11% to 21%, and did double among sophomores from 8% to 16%. Not surprisingly, the increases seen in vaping nicotine were mirrored with significant increases in vaping marijuana among 8th, 10th and 12th graders. Lead study researcher Richard Miech PhD noted that “Factors that make vaping so attractive to youth include its novelty and the easy concealability of the latest vaping devices, which better allows youth to vape without adults knowing about it. If we want to prevent youth from using drugs, including nicotine, vaping will warrant special attention in terms of policy, education campaigns, and prevention programs in the coming years.” Read more. An op-ed in The Regulatory Review explains how “regulation of marijuana has been based on a false distinction for almost a century.” Although components of the marijuana plant may be synthesized into real medications in the future — like the FDA-approved drug Marinol, synthetic THC — medical marijuana will never meet scientific criteria of modern medicine. Author Paul Larkin concludes, “The real question is whether lawmakers should revise federal law to allow marijuana to be used for recreational purposes, just as alcohol and tobacco can be so used today. If Americans are to honestly debate marijuana use, the debate must be over its utility as a recreational drug, not as medicine, and who should regulate its potential uses—the FDA Commissioner or the U.S. Attorney General. The United States has followed the wrong approach to marijuana regulation for 80 years. It is time to get it right.” Read more. The new film “Beautiful Boy” depicts the experiences of a father and son, David and Nic Sheff, as Nic dives deep into a methamphetamine addiction. Not only is this film based on David’s and Nic’s pair of best-selling memoirs, Beautiful Boy and Tweak, the film mirrors the experiences of millions of Americans whose brains have been hijacked by addiction. In this review, IBH President, Dr. Robert DuPont discusses this film and the parallels between Nic and David’s experience and the experiences of the many people with substance use disorders and their families Dr. DuPont has seen throughout his 50 year career. IBH commends David, Nic and all of those involved in making this film, on producing a striking cautionary tale as well as a compelling reminder that recovery is possible for everyone. Read Dr. DuPont’s review here. IBH President Robert L. DuPont, MD presented his book at The Heritage Foundation hosted by Senior Research Fellow Paul Larkin. Following Dr. DuPont’s remarks which focus on the state of the nation’s drug epidemic, the future of prevention and addiction treatment, he answers questions from the audience. Chemical Slavery is available at Amazon.com. In a new prevention toolkit and related video for parents and families, Addiction Policy Forum asks, How do you really keep your kids safe from addiction? Read more. An op-ed in The Washington Post from Alex M. Azar, Secretary of Health and Human Services (HHS) and Scott Gottlieb, Commissioner of the Food and Drug Administration (FDA), brings much-needed attention to the growing problem of youth use of nicotine through e-cigarettes: In one year fom 2017 to 2018, “the number of high-school-age children reporting use of e-cigarettes rose by more than 75 percent. Use among middle-schoolers also increased nearly 50 percent. That is an epidemic… The surge in e-cigarette use by teenagers is alarming because nicotine is highly addictive and can harm brain development, which continues into young adulthood. Worse, kids who start on e-cigarettes are actually more likely than non-user peers to migrate to smoking tobacco…” Read more. IBH promotes the prevention goal for youth under age 21 as One Choice: no use of any alcohol, nicotine, marijuana or other drugs for reasons of health. Read more about One Choice Prevention. October 10, 2018: 7 Reasons Why I Thought AA Wasn't for "Someone Like Me"
The Fix features a powerful statement of a person in recovery who unexpectedly found recovery support in Alcoholics Anonymous. “As time went on, I quickly realized that the reasons I believed that AA wasn’t for me weren’t just misguided, they were completely wrong. While I wish I’d had these realizations sooner, I’m grateful now for the fellowship I found when I was finally able to open my heart and mind.” Read more. He wisely says, “We should pause and catch our breath before racing off again at the industry's urging.” Read more. New data from the nationally representative Monitoring the Future survey show marijuana use among college students has reached the highest levels in three decades. Notable, in 2017 4.4% of college students reported daily or near-daily marijuana use in the past month while 13.7% of same-age non-college students were daily users, a number that has doubled since 2006. Principal investigator John Schulenberg noted, “The brain is still growing in the early 20s, and the scientific evidence indicates that heavy marijuana use can be detrimental to cognitive functioning and mental health… Getting a foothold on the roles and responsibilities of adulthood may be all the more difficult for these one-in-eight noncollege youth who use marijuana on a daily or near daily basis. As for college students, we know from our research and that of others that heavy marijuana use is associated with poor academic performance and dropping out of college.” Read more. At a time when the nation is searching for ways to save lives from opioid and other drug overdoses as well as how to reduce the burden of addiction on individuals, families and communities, IBH President Robert L. DuPont, MD has written Chemical Slavery: Understanding Addiction and Stopping the Drug Epidemic, for parents, teachers, physicians and for everyone afflicted by addiction. The book also guides leaders in public policy and planning positions, as well as drug abuse treatment. Chemical Slavery covers two crucial topics: First, the national drug epidemic including an understanding of its evolution to become a national emergency, and the science of addiction and recovery. Second, Dr. DuPont presents his experience-based guide to the intimate, day-to-day struggle with the disease of addiction from prevention to lasting recovery. This book shows the ways in which these two domains of addiction, the national and the personal, are intertwined and can be both understood and managed. Read more. IBH President Robert L. DuPont, MD underscores that at a contentious time in drug policy – with a rising overdose death rate fueled by opioids and a loud chorus of proponents advocating the legalization of adult marijuana use – there is an important opportunity for all sides to unite around a clear goal for youth substance use prevention. Supporting youth to make One Choice of no use of any alcohol, tobacco, marijuana or other drugs for health is a noncontroversial and importantly, health-oriented, message. Adult substance use disorders are in so many ways pediatric diseases because they trace back to initiation in adolescence when the brain is actively and rapidly developing. Preventing or delaying all adolescent substance use reducing the risk of developing later addiction. IBH encourages the often opposing sides in the drug policy field to unite in their message for youth substance use prevention by embracing and supporting youth to make the One Choice of no use of any alcohol, tobacco, marijuana or other drugs for their health. Read more. The New York Times reports a record number of overdose deaths in 2017, reaching 72,000. Reflecting a 10% increase in deaths from 2016, the overdose epidemic shows little sign of slowing down. "According to the CDC estimates, overdose deaths involving synthetic opioids rose sharply, while deaths from heroin, prescription opioid pills and methadone fell." "Strong synthetic opioids like fentanyl and its analogues have become mixed into black-market supplies of heroin, cocaine, methamphetamine and the class of anti-anxiety medicines known as benzodiazepines. Unlike heroin, which is derived from poppy plants, fentanyl can be manufactured in a laboratory, and it is often easier to transport because it is more concentrated." Read more. A new Gallup poll shows 30% of Americans report drug abuse has caused trouble in their families, up from 22% in 2015, "a signal that the nation's opioid epidemic, which has worsened in recent years, is taking a toll." A total of 37% of Americans report their families are negatively effected by alcohol, similar to past years, and 43% report smoking has caused health problems in their families. Read more. A new IBH study published in the journal Pediatrics with Sharon Levy, MD, Director of the Adolescent Substance Use and Addiction Program at Boston Children's Hospital shows an increasing percentage of American youth are choosing to refrain from using any alcohol, cigarettes, marijuana or other drugs. This study shows that indeed "abstinence is a realistic choice for a growing proportion of high school students." Abstract. Read more. DrugFree Idaho presents a new eye-opening film about the impact of the normalization and legalization of marijuana on the community and youth. With a focus on Pueblo, Colorado and areas of California, the film includes interviews of community representatives from the fields of addiction medicine, emergency medicine, toxicology, pregnancy care, law enforcement, education, ecology, as well as parents of people in active addition. Watch the film. The New York Times takes an in-depth look at the work of Dr. Nicole Gastala, a primary care physician in Iowa who is folding addiction treatment into her family practice daily. "She gauges each patient’s progress, asking about their highs and lows since their last appointment. She also tests their urine to check for other drugs and that they’re not misusing or diverting the medication. And she makes sure they’re going to therapy, which the program requires." Dr. Gastala notes that in all her medical training she was taught next to nothing about addiction and how to treat it, underscoring the stark addiction education gap in medicine today. Read more. In a Wall Street Journal editorial, the co-founders of Smart Approaches to Marijuana (SAM) Kevin Sabet, PhD and Former Congressman Patrick Kennedy reject a recent call for national legalization of recreational marijuana which would enable the rapid expansion of Big Marijuana. They note "public-health data from states that have legalized strongly indicate that it is a failed experiment, resulting in more fatalities from driving while stoned, more emergency-room visits and poison-control calls, and more worker accidents and absenteeism." At a time of contentious debate, "federal lawmakers should not be accelerating the proliferation of an industry that routinely targets children and minority communities." Read more. A new analysis of data from the National Survey on Drug Use and Health (NSDUH) published in Preventive Medicine shows that youth use of any one gateway drug - alcohol, cigarettes, marijuana - increases the likelihood of using the other two and other illicit drugs. Similarly, non-use of any one of the three gateway drugs is associated with non-use of the other two drugs, and non-use of other illicit drugs. Study abstract. IBH data graphs. A recent interview of IBH President Robert L. DuPont by The Opioid Research Institute focused on the national public health crisis of opioid overdose deaths. Now featured on Huffpost, Dr. DuPont emphasizes that now is the time to end the war between treatment modalities that use and do not use medications. There are critical ways in which treatment can be improved including patient retention and participation in recovery support. Read more. An article from Smart Approaches to Marijuana (SAM) shines a much needed spotlight on new data from the nationally representative Monitoring the Future study of American youth. Notably "one in four 12th graders thought that they would try marijuana, or that their use would increase, if marijuana were legalized." This is a record high number, much greater than ever predicted. Nearly half of all 12th graders (49%) supported marijuana legalization, a figure that has steadily risen since 2008 when it was 30%. The study authors report, "It is likely that the growing number of states that have legalized recreational marijuana use for adults plays a role in the increasing tolerance of marijuana use among 12th grade students, who may interpret increasing legalization as a sign that marijuana use is safe and state-sanctioned." SAM Article. Monitoring the Future study. To learn more about youth prevention visit www.OneChoicePrevention.org. A study from the PEW Research Center shows the majority of Americans in rural, suburban and urban view addiction as a problem in their local community - with all types of communities experiencing significant increases in the number of overdose deaths. Although the drug overdose death rate is highest among whites, between 2015 and 2016 the overdose death rate rose 40% among black Americans, and among black men in urban counties, the fatality rate rose 50% in one year. Read more. A new report from the Governors Highway Safety Association (GHSA) and the Foundation for Advancing Alcohol Responsibility shows that in 2016 43.6% of fatally injured drivers with known drug test results were drug-positive. Over half of drug-positive drivers were positive for two or more drugs and 40.7% of drug-positive drivers were also positive for alcohol. Marijuana was the most common drug among fatally-injured drivers -- its prevalence has increased in recent years as well as the prevalence of opioids. In the face of a national opioid epidemic and expanding efforts to legalize marijuana for recreational use, new focused attention, including effective policies and enforcement efforts are needed to address the serious problem of drug-impaired driving. Full report. Read more. Visit the IBH website www.StopDruggedDriving.org. In an interview with The Boston Globe Nora D. Volkow, MD, Director of the National Institute on Drug Abuse (NIDA) was asked about marijuana legalization. She warned, "The greatest mortality from drugs comes from legal drugs. The moment you make a drug legal, you’re going to increase the number of people who get exposed to it, and therefore you increase the negative consequences from its use. When you legalize, you create an industry whose purpose is to make money selling those drugs. And how do you sell it? Mostly by enticing people to take them and entice them to take high quantities." Read more. More from IBH on drug legalization. Past studies that have shown a negative population-level correlation between medical marijuana availability in states and trends in medical and nonmedical prescription drug use have spurred a misguided claim that medical marijuana reduces medical and nonmedical prescription drug use. A new study published in the Journal of Addiction Medicine shows that in fact medical marijuana users are more likely to use prescription drugs. Authors explain, "Medical marijuana users were at higher risk for prescription drug use and specifically nonmedical prescription drug use than medical marijuana nonusers in a large national survey. We also found elevated risks of nonmedical prescription drug use among medical marijuana patients when analyzing only the subset of the population that used prescription drugs. This suggests that the elevated risk for prescription drug nonmedical use among medical marijuana users cannot be ascribed simply to their having a medical concern or greater access to prescription drugs." Authors conclude that "Medical marijuana users should be a target population in efforts to combat nonmedical prescription drug use." Read more. The Washington Post highlights data from the Monitoring the Future study showing that American teenagers are using less alcohol than teens of the past (something previously recognized by the Institute for Behavior and Health). Baby boomers, however, born between 1946 and 1964, are engaging in higher rates of binge drinking. Researchers at the National Institute on Alcohol Abuse and Alcoholism (NIAAA) are seeing an increase in the prevalence of alcohol use disorders among Americans age 65 and older. Read more. Pittsburgh Post-Gazette Columnist, Rich Lord writes about the role schools play in fighting drug use and addiction. Most addictions start with drug use during adolescence ad earlier users are more likely to become addicted. Schools have the opportunity to play an integral role in preventing addiction. In this piece, Lord outlines the toll drugs are taking in schools across the country and the actions schools can take to prevent further drug addiction and deaths (Read more here). Additionally, Rich Lord outlines a few ways that parents and peers can help students make One Choice to not use any alcohol, tobacco, marijuana or other drugs, in this brief article. Read more. The Institute for Behavior and Health co-hosted a meeting with the Heritage Foundation and Smart Approaches to Marijuana (SAM) entitled, Drugged Driving: What are the Problems? What are the Solutions? The event brought together national experts to discuss the science of drug-impaired driving, the current data gaps and complex policy issues on this serious public safety threat. Read more on the IBH Events page. For more information about drugged driving, visit the IBH website www.StopDruggedDriving.org. In a new commentary from the Institute for Behavior and Health, Robert L. DuPont, MD underscores that at a contentious time in drug policy – with a rising overdose death rate fueled by opioids and a loud chorus of proponents advocating the legalization of adult marijuana use, there is an important opportunity for all sides to unite around a clear goal for youth substance use prevention. Supporting youth to make One Choice of no use of any alcohol, tobacco, marijuana or other drugs for health is a noncontroversial and importantly, health-oriented, message. Adult substance use disorders are in so many ways pediatric diseases because they trace back to initiation in adolescence when the brain is actively and rapidly developing. Preventing or delaying all adolescent substance use reducing the risk of developing later addiction. IBH encourages the often opposing sides in the drug policy field to unite in their message for youth substance use prevention by embracing and supporting youth to make the One Choice of no use of any alcohol, tobacco, marijuana or other drugs for their health. Read more. January 9, 2018: We mobilized against flu, cancer and heart attacks. Where's the urgency on opioids? In an op-ed in USA Today, General Barry McCaffrey, former Director of the Office of National Drug Control Policy, and Jessica Nickel, President & CEO of the Addiction Policy Forum, asks where is the urgency on addressing the national public health crisis of opioid addiction. They note, "Our country deserves the same medical urgency today in addressing addiction as we had for H1N1, Ebola, cardiovascular disease or any other illness for which we’ve mobilized a national response. We have the tools we need to both prevent and treat opioid use disorders; we have the science and the interventions. We need to move forward with urgency to implement them." Read more. In a new article published in The Journal of Global Drug Policy and Practice, IBH President Robert L. DuPont, MD outlines the complicated circumstances that have led to the national opioid epidemic. He offers this new narrative to improve future national drug policy. Read more. The Pew Charitable Trusts' Stateline reports a large increase in the use of prescription drug monitoring programs (PDMPs) for prescribing physicians and pharmacists to check the current prescriptions of patients. Notably 47 states have added data to PDMPs from nearby states to determine if patients receive prescriptions from outside the state. The overdose epidemic, driven by opioids, has brought a new focus on the utility of PDMPs, with 39 states now requiring healthcare professionals to check the PDMP before writing a prescription for opioids. Read more. For the second year in a row, life expectancy in the US has declined - driven by an increase in deaths among people under age 65. Two briefs from the National Center for Health Statistics (NCHS), part of the US Centers for Disease Control and Prevention, show that more young people are dying of drug overdose deaths. Nationally, the number of overdose deaths set a new record of 63,600 in 2016, an average of 174 people every day. 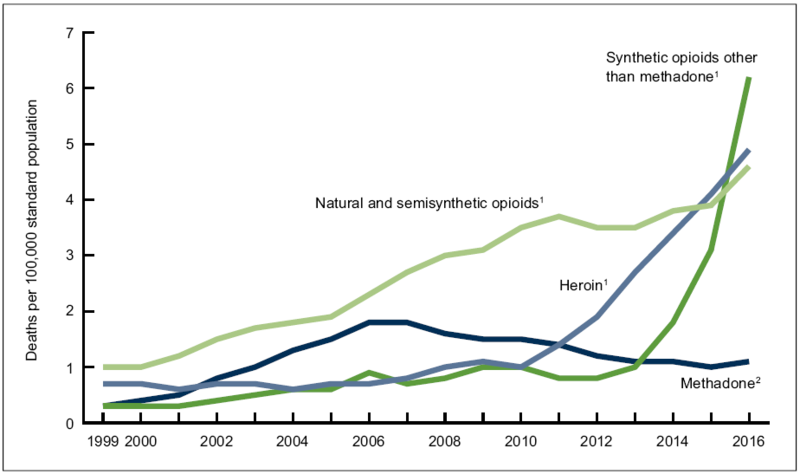 The most common drugs present in overdose death are opioids, with deaths involving synthetic opioids other than methadone (e.g., fentanyl, fentanyl analogues and tramadol) doubling from 2015 to 2016. Read the NCHS Data Brief Drug Overdose Deaths in the United States, 1999-2016 and NCHS Data Brief Mortality in the US. Read more. The White House Council of Economic Advisers released a new report entitled, The Underestimated Costs of the Opioid Crisis, announcing that the opioid crisis cost the US economy $504 billion, or 2.8% of the gross domestic product that year. The report notes that, "previous studies and estimates fail to fully account for the lives lost to overdose," which in part is why the new estimate is more than six times higher than previous estimates. Read more. An editorial from The Colorado Springs Gazette showcases the real consequences to the state of a large commercial marijuana industry from increases in marijuana-related motor vehicle fatalities to school-based drug violations. It reports, "Five years of retail pot coincide with five years of a homelessness growth rate that ranks among the highest rates in the country. Directors of homeless shelters, and people who live on the streets, tell us homeless substance abusers migrate here for easy access to pot." The full consequences of commercial marijuana legalization will not be realized for years, but until then, the paper warns that Colorado serves as an "embarrassing cautionary tale." Read more. On October 26, 2017, IBH President Robert L. DuPont, MD was present at the White House for remarks by the President that the national opioid epidemic is a public health emergency. One week later, the President’s Commission on Combating Drug Addiction and the Opioid Crisis led by Governor Chris Christie released its Final Report with recommendations on how to immediately address this crisis, ranging in scope from federal funding and programs, to new opioid addiction prevention, treatment, including access to overdose reversal and recovery, and research and development. There is strong bipartisan support to curb the epidemic of overdose deaths making it the right time for the nation to come together to improve prevention and treatment and to promote long-term recovery. Read more. A study from PEW Research Center reports that 46% of adults in the US have a family member or close friend who is currently addicted or has been addicted to drugs in the past. The study confirms that addiction cuts across all sociodemographic characteristics including age, race and education. Read more. The Rocky Mountain High Intensity Drug Trafficking Area (RM-HIDTA) continues to document the impact of legalized marijuana in Colorado including marijuana-related impaired driving and fatalities, youth and adult marijuana use, emergency room admissions, marijuana-related exposure cases and marijuana diversion. The Legalization of Marijuana: The Impact highlights three time frames: early medical marijuana era from 2000-2008, medical marijuana commercialization era from 2009-present, and recreational marijuana era from 2013-present. Read more. IBH President Robert L. DuPont, MD participated in a substance use disorder symposium hosted at the Walter Reed National Military Medical Center. The Journal of DC Military.com reported that in speaking to an audience that included, among others, health care providers and researchers, Dr. DuPont noted, "while the opioid crisis is now garnering much attention, 90 percent of substance use disorders are rooted in drug and alcohol use beginning in the 'uniquely vulnerable teenage years' with three gateway drugs: alcohol, tobacco and marijuana... Prevention is about any and all drug use by youth.'" Read more. A new study conducted by researchers at the National Institute on Drug Abuse (NIDA) and Columbia University, concluded that marijuana use increases the risk of non-medical opioid use and opioid addiction. This study comes after several reports that opioid use disorders are down in states that have legalized marijuana. These studies, which use statewide date, do not show the effect of marijuana use on the individual. The NIDA and Columbia University study followed individuals from 2001 to 2005 and found that those who used marijuana in 2001 were more likely to misuse and be addicted to opioids in 2005. This study adds to the growing body of research highlighting the health dangers of marijuana. Read more. In 2013 the US Department of Justice (DOJ) released the "Cole Memo" directing law enforcement officials to focus resources and prosecutions on individuals and organizations that interfere with any of eight key priorities ranging from preventing distribution of marijuana to minors to preventing drugged driving. Smart Approaches to Marijuana (SAM) released a comprehensive assessment of states with established retail marijuana markets - Colorado, Washington and Oregon - showing they have failed to meet at least seven of the eight priorities. Read more. In The Washington Post Wonkblog, Keith Humphreys, PhD explains the national data on heroin addiction and heroin-related deaths is far from complete. Both heroin deaths and the prevalence of heroin use disorders are dramatically higher than present estimates suggest. Data is unlikely to be improved with recent reductions in federal research spending. Dr. Humprheys notes that without new investments in research, "the nation will continue to fly blind on the heroin epidemic, unable to determine whether current policies are making the problem better, worse, or making no difference at all." Read more. In an article in Risk Management, IBH President Robert L. DuPont, MD reviews new data from the 2016 Quest Diagnostics Drug Testing Index showing increases in rates of positive drug tests within the American workforce. He notes that "while current policy discussions are largely focused on marijuana, employers must not lose sight of the other trends in workforce drug positivity. Drug use of any kind can have a major impact on workplace safety and productivity. Employers need to be aware of the problem and take any necessary steps to protect their employees and their workplaces from the threat of drug use." Read more. A study published in The Review of Economic Studies describes a natural experiment on the effects of marijuana legalization. Students attending Maastricht University from nations outside The Netherlands were banned from marijuana cafes in the city while students from The Netherlands maintained legal access to marijuana. Academic performance substantially increased among students who were no longer able to purchase legal marijuana, particularly among low performing students. In an article published by The Washington Post, Keith Humphreys, PhD reviews the study noting that it "provides highly credible evidence that marijuana legalization will lead to decreased academic success — perhaps particularly so for struggling students — and that is a concern that both proponents and opponents of legalization should keep in mind." Read more. In a new commentary on The Daily Signal, IBH President Robert L. DuPont, MD joins William J. Bennett, the first Director of the Office of National Drug Control Policy (ONDCP), to clarify the fundamental elements of the national opioid epidemic. "The main problem today, and the growth for tomorrow, is illegal opioids such as heroin, illegal fentanyl, and a hundred other synthetics, not legal drugs used illegally or in ways not as prescribed. If we are going to tackle the opioid issue head-on, we must take illegal drugs head-on..." Additionally, while efforts to improve access to and quality of treatment are indeed needed, the role of prevention is almost entirely ignored. Addiction is unique because unlike some other chronic diseases it is entirely preventable -- and 90% of substance use disorders are traced to adolescence. The US has achieved great success in reducing illegal drug use in the past; now is the time to reengage the nation on prevention to stop addiction before it starts. Read more. Drs. Bennett and DuPont serve as senior advisers to Americans for Responsible Drug Policy. In National Affairs psychiatrist Sally Satel, MD weighs in on the opioid epidemic, reviewing the history of its spread across the United States and underscoring both treatment and enforcement needs. Importantly, Dr. Satel highlights the problems within the current treatment system and features programs that have the potential to make significant impacts in reducing drug use and improving outcomes. Read more. Institute of Behavior and Health president Dr. Robert L DuPont was invited to Rye, New York to talk to parents and students about preventing youth drug use. Between January 2014 and May 2016, the town of Rye lost 6 young people to drug overdoses. In response to the drug problem in Rye, community members formed RyeAct, a coalition dedicated to preventing teen drug use and overdose deaths. Dr. DuPont spoke about the important role parents play in prevention as well as the importance of discouraging use of any drugs, including alcohol, tobacco, and marijuana. Watch his full presentation here. Supporting the recommendations in the 2016 Surgeon General’s Report, the group agreed that addiction is a serious chronic illness and promoted the development of a modern continuum of public health care for addiction. The group specified that abstinence is an achievable, high-value outcome, both for prevention and treatment. The group recognized the paucity of current models for systematic integration of addiction treatment and general healthcare. The group encouraged the identification of promising models and the promotion of innovation to achieve the goal of sustained recovery, defined as no use of any alcohol or illegal drugs other than medicines that are prescribed and monitored to sustain recovery. In this op-ed, author Seth Leibsohn reveals the politicization of the opioid crisis in America noting that pharmaceutical companies are being selectively investigated based on politicians' interests. He also illuminates the major misconceptions about the opioid crisis. Prescribing opioids alone does not explain the increase in non-medical use of opioids or the increase in overdoses. The vast majority of people who use prescription opioids non-medically get drugs from friends and family members rather than their own prescriptions. Furthermore, simply using an opioid for a medical purpose does not cause addiction. People are more likely to abuse opioids if they use them in combination with other drugs including alcohol. Read more. IBH was pleased to present the US Surgeon General Vice Admiral Vivek H. Murthy, MD with the John P. McGovern Award in recognition of his national leadership on the serious public health problem of addiction with the historic release of Facing Addiction in America: The Surgeon General's Report on Alcohol, Drugs and Health. The first-ever Surgeon General's report on addiction has catalyzed and challenged the nation to constructively confront the drug epidemic, underscoring two vital points -- that substance use and substance use disorders are preventable and that treatment leading to sustained recovery is possible. In an op-ed published by The Washington Post, former Congressman Patrick Kennedy and President of Smart Approaches to Marijuana Kevin Sabet, PhD put a spotlight on the growing marijuana industry which is focused on making profits, not improving public health. Kennedy and Sabet call for "a federal enforcement strategy that not only promotes human rights and social justice, but also actively targets and deters the special interests driving Big Marijuana." Now is the time to acknowledge the health risks posed by marijuana and develop national, state and local policies that will improve - and not harm - the public health. Read more. The American Academy of Pediatrics (AAP) released a new Clinical Report, "Counseling Parents and Teens About Marijuana Use in the Era of Legalization of Marijuana", emphasizing that even though in some states marijuana is legal for adults, marijuana use by teens and young people poses significant health risks (and remains illegal). The developing brain is uniquely vulnerability. Pediatricians are in position to provide useful guidance to parents and young patients about making healthy choices, including refraining from marijuana and other substance use. Underscoring the fact that marijuana use is not a benign drug for teens, the AAP presents useful talking points for parents and teens. Read more. On November 24 and 25, 2016, the Pontifical Academy of Sciences (PAS) held a meeting at the Vatican with international experts, led and inspired by Pope Francis and Queen Silvia of Sweden, to develop a global view of the current drug epidemic and recommendations to reverse this trend, one that imperils the very elements of civil society: public health, safety and human progress. The final statement released by PAS makes a series of recommendations for nations underscoring the importance of prevention, treatment, embracing the goal of long-term recovery and specifically protecting vulnerable populations, including children and youth. Read more. The release of Facing Addiction in America: The Surgeon General’s Report on Alcohol, Drugs, and Health provides the country with direction amidst a widespread drug epidemic. The Institute for Behavior and Health commends the Office of the Surgeon General for the clear statement that substance use disorders are preventable and that long-term recovery is possible. However, IBH goes beyond the Report in defining the fundamental goals of substance abuse prevention and treatment. First, IBH defines the goal of youth substance abuse prevention as no use of any alcohol, tobacco, marijuana or other drugs for reasons of health. Second, IBH defines the goal of substance abuse treatment as sustained recovery with a standard outcome measure of treatment of no use of such substances for at least five years. In an new commentary IBH President Robert L. DuPont, MD discusses how these two goals can strengthen the Surgeon General’s call for national leaders to redouble their commitment to prevention, treatment and recovery. Read more. Marijuana use among 10th graders in Washington State has increased since legalization, a new report finds. The biannual Healthy Youth Survey showed a significant increase in the number of teens who had used marijuana in the last 30 days and an increase in the number that had used marijuana 10 or more days during that 30 day period. Of particular concern was the number of teens reporting they get marijuana at home both with and without parental permission. To learn more about the effects of marijuana on teens click here. A new study conducted by researchers at Columbia University Medical Center reveals that the number of women using marijuana while pregnant has risen 62% between 2002 and 2014. Of the women studied, pregnant women between 18 and 25 showed the highest prevalence of marijuana use during pregnancy. While future studies are needed to explore dose and frequency of use, it is without a doubt that marijuana use during pregnancy is harmful to the child. Read more about the harmful effects of marijuana during pregnancy. The Pontifical Academy of Sciences hosted a workshop of international leaders at the Vatican entitled, Narcotics: Problems and Solutions of this Global Issue, led and inspired by Pope Francis and Queen Silvia of Sweden. IBH President Robert L. DuPont, MD addressed participants with a call to action to turn back the modern drug epidemic by developing and refining a global drug policy that discourages recreational pharmacology and limits the use of incarceration, rooted in a foundation of human rights and fundamental values. Read Dr. DuPont's prepared remarks. Watch Dr. DuPont's presentation. PAS Workshop. The first-ever Surgeon General's Report on addiction reviews the neurobiology of addiction, current evidence-based prevention methods, and how treatment providers and the healthcare system at large are supporting long-term recovery. This Report is a huge step towards national efforts to treat substance use disorders like other chronic diseases and to making long-term recovery an expected outcome of treatment. Read more. Researchers at Stanford conducted a survey of 786 high school students about their perceptions of marijuana and blunts. The study found that students were more likely to use marijuana if they believed their friends were using marijuana and if they were exposed to advertisements about the health benefits of marijuana. Many teens believed marijuana was less addictive and posed less health risks than tobacco. This study highlights the risk of increased marijuana use if California voters pass Proposition 64 which would legalize marijuana use, and allow TV ads for marijuana. Read more. The University of Maryland’s Center on Young Adult Health and Development released a research brief from their ongoing College Life Study. This study followed 1,253 students for 10 years, beginning in their first year of college. Students were assessed annually on their marijuana use and 9 health outcomes including functional impairment due to injury and psychological distress, and physical health service utilization. The study found that students who did not use marijuana had better outcomes than students who did. Students that used marijuana for a limited time fared worse than students who did not use at all, but better than students who maintained or increased their use through time. Read more. A new IBH commentary highlights the role of marijuana in the serious public safety problem of driving under the influence of drugs (DUID). Important lessons can be learned from the inadequate laws implemented in Colorado and Washington, two that have legalized marijuana. With a growing trend to increase legal access to marijuana, policymakers must implement effective laws supported by practical enforcement measures to protect the public. IBH reviews current DUI law enforcement procedures and makes recommendations for new DUID actions. Accompanying this commentary is a model law developed by IBH with the National Partnership on Alcohol Misuse and Crime. Read more. University of Maryland’s Center on Young Adult Health and Development published this guide to Collegiate Recovery Programs (CRPs). With 1 in 6 US college students meeting the clinical criteria for substance use disorder and many in recovery, colleges need to implement programming that meets these students’ needs. This guide gives a basic overview of evidence based CRP’s that could be implemented in many more colleges. Read more. In response to the costs of lengthy criminal sentences and high rates of reoffending, the state of Washington tried a new approach that made punishments more certain and less severe. Instead of 30, 60, 90, or 120 day jail sentences for supervised offenders who violate their terms of parole or probation, Washington now relies on “flash incarceration” of up to 3 day. These penalties can be delivered more swiftly than the longer sentences Washington used before. A 12 month study of this swift and certain punishment model showed an 84% drop in the odds of a supervised offender being sent to prison. The swift and certain approach has also shown positive results in Hawaii’s HOPE program and South Dakota’s 24/7 Sobriety Program. (More on criminal justice from IBH) These results show that punishment and crime can be reduced at the same time if resources are allocated more wisely. Read more. The Maryland Collaborative to Reduce College Drinking and Related Problems has published a review of the research on the relationship between alcohol and sexual assault on college campuses. Highlighting that alcohol is a strong risk factor, not a cause, for sexual assault, the Maryland Collaborative suggests that reducing college alcohol consumption is a crucial part of a multifaceted approach to preventing sexual assault on college campuses. Read more. A recent study published in Open Forum Infectious Diseases found an increase in a heart infection, known as infective endocarditis (IE), among young injection drug users. The study revealed that hospitalizations for IE caused by injection drug use (IDU-IE) rose from 7% in 2000 to 12% in 2013 of all infective endocarditis hospitalizations in the US. Study author Dr. Thomas Stopka says “We’re seeing a shift toward youth, white youth, and women, and it’s likely that we’ll continue to see even higher increases.” Young adults between the ages of 15 and 34 grew from 28% of IDU-IE in 2000 cases to 42% in 2013. Infective endocarditis is a sometimes fatal infection of the heart valves that can be triggered by injection drug use that introduces bacteria into the bloodstream. Researchers hope that further education on the dangers of injection drug use will curb this trend. Read more. A new study conducted in China indicates that opioid and prescription drug abuse may be connected to teen suicide ideation and suicide attempts. This study, published in JAMA Pediatrics, surveyed 3,300 Chinese youth at age 14 and again a year later. The results showed a positive correlation between baseline nonmedical use of opioids, sedatives and any prescription drug and suicide ideation at follow-up. Those who reported nonmedical use of opioids and any prescription drug at baseline were also more likely to have attempted suicide at follow-up than those who did not. These findings have significant relevance to the importance of youth substance use prevention. Read more. In an article featured in the Health Affairs blog Sharon Levy, MD emphasizes the important role of pediatricians in screening their young patients for substance use at well-visits, highlighting a clinical report and companion policy statement recently released by the American Academy of Pediatrics (AAP). As Dr. Levy notes, "simple, clear messages about the health benefits of abstinence for adolescents hold the promise of producing long-lasting prevention of substance use disorders...Ultimately, the American Academy of Pediatrics is encouraging primary health care providers to embrace and routinely deliver to their adolescent patients a message that says that their health is best served by not using any alcohol, tobacco, marijuana, or other drugs. What is more, a clear message to abstain does not conflict with substantive education on the topic; the AAP guidelines recognize that some adolescents reject abstinence, and suggests strategies for discussions about minimizing risks, but only after delivering a clear abstinence message." Read more. The expectation of no use is achievable as demonstrated by national data featured in an IBH commentary showing that a substantial and growing percentage of young people are choosing not to use any alcohol, cigarettes, marijuana or other drugs. In an editorial published by ASAM Magazine, IBH President Robert L. DuPont, MD takes on two important challenges facing addiction treatment today: the lack of a focus on achieving long-term recovery and a longstanding conflict within treatment between those who support medication-assisted treatment and those who support treatment without medications. At a time when health care is moving toward focusing on prevention, identification, and management of chronic illnesses, now is the time to shift the addiction treatment paradigm so that substance use disorders are treated as serious chronic illnesses. Dr. DuPont advocates for the use of a five-year standard of recovery for the management of substance use disorders. As he states, "The five-year standard will also reduce the self-destructive battles between MAT and drug-free treatment as all treatments for substance use disorders compete for the best outcomes in the long-term interest of addicted patients, their families and their communities." Read more. A. Thomas McLellan, PhD, in a companion commentary, provides his perspective, recommending using a standard of one-year recovery. As Dr. McLellan states, both he and Dr. DuPont agree that it is time for the field of addiction treatment to come to consensus on standards of effectiveness or recovery measurement and that the American Society of Addiction Medicine can spearhead this effort. The New York Times highlighted new findings from a study published in JAMA Pediatrics, a journal of the American Medical Association, showing that following the legal sale of recreational marijuana in Colorado, the number of marijuana poisoning cases among children increased an average of 34% each year. About half of the poisoning cases involved edible marijuana products (e.g., brownies, cookies, sodas, etc.). Authors note that "almost half of the patients seen in the children’s hospital in the two years after legalization had exposures from recreational marijuana, suggesting that legalization did affect the incidence of exposures." Read more. With the nation facing an epidemic of opioid and heroin overdose deaths, now is the time to address the serious need for substance use disorder treatment - and specifically, improved treatment outcomes. Because substance use disorders are life-long diseases, in a new commentary, IBH President Robert L. DuPont, MD describes lessons that can be learned from the state physician health programs (PHPs) which set the standard for long-term outcomes for substance use disorders. The US health care system is now in the early stages of being transformed to focus intensely on serious chronic disorders including prevention, early intervention, effective treatment and long-term monitoring. Substance use disorders must be a part of this transformation of care management. Dr. DuPont recommends the use of five-year recovery as a standard measure for treatment outcomes. Read more. The New York Times opinion series "Room for Debate" asked if marijuana should be legalized in the face of today's heroin and opioid crisis and if it is a gateway drug. IBH President Robert L. DuPont, MD contributed to the series stating that marijuana use is positively correlated with other drug use; marijuana users consume more legal and illegal drugs than non-users. Rather than legalize drugs, effective prevention is needed. He clearly states that establishing marijuana "as a third legal drug, along with tobacco and alcohol, will increase drug abuse, including the expanding opioid epidemic." Read more. In preparation for the upcoming 2016 UNGASS meeting held in New York, the International Task Force on Strategic Drug Policy (ITFSDP) has developed a paper titled, "Consequences of Marijuana Legalization in the United States and the International Implications." An accompanying one-page handout provides a breakdown of the impact of marijuana legalization in the states of Colorado and Washington. Read more. KET, a Kentucky PBS affiliate, complied highlights from the fifth annual National Rx Drug Abuse and Heroin Summit held in Atlanta, Georgia. Among the keynote speakers were President Barack Obama, US Congressman Harold "Hal Rogers, and US Surgeon General Vivek H. Murthy. IBH President Robert L. DuPont, MD provides additional commentary about the event at the end of the video segment. Watch the Highlights. With national polls showing that the majority, 62%, of Americans report drug use is a serious problem in their community and 68% said not enough is being done to improve treatment, there is a strong focus on addiction on the 2016 campaign trail. As the Washington Post reports, "groups around the US that work on addiction-related issues are arranging forums in primary and battleground states to press candidates to back up their expressions of compassion with specific policy recommendations." Read more. The Institute for Behavior and Health, Inc. (IBH) has released a new report entitled, A Strategy to Assess the Consequences of Marijuana Legalization. With the passage in several states of ballot and state legislative initiatives to legalize the production, sale and use of marijuana, there is a pressing need for a formal repository of information related to the public health, safety and other consequences, both of marijuana use and of marijuana legalization, as well as changes in public attitude about marijuana use and policies. This requires a sustained and repeated systematic annual collection, analysis and reporting of these data to the public through an annual report. Future public policy decisions will depend on this information. This Strategy urges a Congressional mandate to designate and appropriate the necessary funds for the management and coordination of this work using data and research from new and currently existing federal sources. In addition to a federally mandated reporting system, the Strategy strongly recommends the creation of state-based reporting systems and urges private organizations and foundations to become involved. Read more. An NPR article takes focus on the struggles of treating opioid addiction among teens, a patient population with unique needs. Today there is a lack of long-term and follow-up care. Few physicians have any training in identifying and treating substance use disorders. Given that most substance use problems begin in adolescence, physicians are in a good position to identify substance use and to provide patients with appropriate care. Read more. National Affairs features an article on marijuana by Jonathan Caulkins, PhD, Sever Professor of Operations Research and Public Policy at Carnegie Mellow University's Heinz College. Dr. Caulkins breaks down data on how marijuana is used in the United States. Specifically, "marijuana use is highly concentrated among the small proportion who use daily or near-daily." Among the highlights, he notes that marijuana "...as now used in the United States - creates higher rates of behavioral problems, including dependence, among all its users" than alcohol. Read more. Health officials in St. Lucia warn that mixing marijuana and tobacco is causing a significant increase in the number of young people with chronic obstructive pulmonary disease (COPD). The medical director of Victoria Hospital reports that that bed space is "severely compromised" because of the increased rates of this debilitating disease. Read more. In a new IBH Commentary Robert L. DuPont, MD discusses the significant increase in self-reported marijuana use among adults over the past decade and the corresponding significant increase in the number of Americans with a marijuana use disorder. Establishing a legal market for marijuana has not eliminated the illegal market for marijuana in states with legalization. This is because the illegal market does not have to comply with regulations on growth and sale or pay taxes on sales or their profits. Because drug legalization enhances drug supply and reduces social disapproval of drugs, our nation must prepare itself for the negative consequences of increased marijuana use. Read more. In an op-ed published in the Colorado Springs Gazette, IBH President Robert L. DuPont, MD is joined by former DEA Administrator Peter Bensinger and Hudson Institute trustee Linden Blue discussing the negative consequences of marijuana legalization in Colorado. They note three key facts: 1) the illegal market for marijuana persists; 2) a powerful new marijuana industry has emerged; and 3) alcohol use has not declined since marijuana legalization. "The citizens of Colorado are left with the disturbing consequence of their dangerous experiment." Read more. The New York Times reviews the mixed results of the Monitoring the Future study of teen substance use. Among high school seniors, declines were seen in the use of prescription painkillers, alcohol and cigarettes. This is welcome news; however, for the first time ever, daily marijuana use exceeded daily cigarette use. This is in part due to an increase in daily marijuana use and a increase in e-cigarette use. Read more. Although drug legalization has become an international topic of debate, including in Sweden, 91% of Swedes think drugs should remain illegal. Sweden has a restrictive drug policy with strong emphasis on prevention that leverages the criminal justice system to increase assess to treatment. As a result, Sweden maintains one of the lowest drug use rates in Europe. The Institute for Behavior and Health strongly supports the Swedish model of drug policy; Sweden is the best example of how restrictive policy can be effective in reducing illegal drug use with broad and steady political support for linking treatment and the criminal justice system. Read more. In Bloomberg View Sally L. Satel, MD explains that while there is bipartisan support for increasing access to treatment for drug-involved offenders, "referral to treatment alone is not enough". She explains that there is a role for the criminal justice system because it provides the leverage needed to hold individuals accountable. Both drug courts and HOPE Probation are effective strategies to engage offenders with substance use problems in treatment and succeed under community supervision, leading to decreases in incarceration and recidivism. Read more. New research shows that white Americans aged 45 to 55 are dying at significantly higher rates, particularly among those with high school education or less. David W. Murray of the Hudson Institute highlights the overlooked role of adolescent drug use suggesting that it may be the root cause. Specifically, this older population which has seen increases in illicit drug use, was likely a population that initiated drug use early in life. He argues that "higher mortality for the cohort seen between 1999-2013 was conditioned by the higher rates of substance abuse through which they passed as adolescents/young adults. This cannot be a definitive analysis, but it does seem important to ask more generally: does teen drug use shorten lives, particularly for the working class and the disadvantaged, the effect continued into later life?" Read more. IBH President Robert L. DuPont, MD weighed in on a New York Times debate about coerced treatment, noting that few addicts enter treatment without meaningful coercion in part because the vast majority of people with substance use disorders do not think they have a problem. Dr. DuPont highlights HOPE Probation and the physician health programs as two examples of effective coercion that overcome addiction in two very different populations. He notes the contrast between addicts while using drugs and alcohol compared to when they are drug-free. "In the process of recovery there is a transition from near-universal denial of problems and rejection of treatment to gratitude for and acceptance of the coercion that got them on that path." Read more. President Obama released a plan to address the epidemic of addiction related to prescription painkillers and heroin. He called for an increased focus on training more physicians who can prescribe buprenorphine, curbing overprescribing, increasing data collection on overdoses, and expand access to Naloxone to reverse overdoses. As reported by The Washington Post, Obama said "We can't fight this epidemic without eliminating stigma. With no other disease do we wait until people are a danger to themselves or others...This is an illness, and we've got to treat it as such." Read more. Data from the Centers for Disease Control and Prevention (CDC) show that while cigarette use among teens has declined dramatically over the last two decades, marijuana use has increased. Twice as many teens are smoking marijuana than did in 1997 and since 2010, more 12th graders have used marijuana than cigarettes. As researchers note, the "public health advances in adolescent health resulting from lower cigarette and cigar use might be attenuated by increases in marijuana use..." Read more. CDC Report. Adult marijuana use more than doubled between 2001 and 2013, with 9.5% reporting past year use. Nearly 3 of every 10 of those adults has a marijuana-use disorder, totaling about 6.8 million Americans. Researchers caution that changes to laws and policies to legalize the recreational use of marijuana will likely increase the number of marijuana users and further, that as marijuana use increases, so will the number of people with problems related to their use increase, including marijuana use disorders. Read more. The Harvard Gazette interviews leading experts in addiction research and treatment as part of a three-part report on the opioid overdose crisis. The dramatic increase in the availability and prescribing of opioids has brought nonmedical use to the forefront of drug problems in the US. Following efforts to limit their nonmedical use, many users are shifting to heroin which is vastly cheaper than prescription opioids and is widely available. The biology of addiction is discussed, including an important highlight that substance use disorders most often can be traced to initiation in adolescence when the human brain is not fully developed and is highly vulnerable. Read more. The Institute for Behavior and Health teamed with Judge Steven S. Alm Honolulu Probation Section Administrator Cheryl Inouye on a project to develop a comprehensive description of the HOPE strategy through a grant provided by the Laura and John Arnold Foundation. HOPE is a strategy to effect positive behavioral change for those under court supervision. Focused on higher-risk offenders, jurisdictions in numerous states across the country have implemented the HOPE strategy in pretrial, probation, parole, and even prison settings. The resulting report from this project, State of the Art of HOPE Probation, serves as a tool for criminal justice practitioners interested in implementing the HOPE strategy. Additional materials from the project are available online. As part of the release of the project materials, IBH hosted a meeting of policy leaders in Washington, DC. The Washington Post reports on the increasing prevalence of synthetic drug use in the District of Columbia, with a sudden increase in the number of 911 calls and over eight times the number of emergency room visits for synthetic drugs than last year. Much about these substances is unknown, with formulations continually changing and some combined with other drugs including heroin and PCP. Eric Wish, PhD of the Center for Substance Abuse Research (CESAR) at the University of Maryland aptly said that synthetic drug users are "playing Russian roulette with their bodies." DC officials are now targeting businesses that sell synthetic drugs. Read more. NBC News highlights dramatic findings from a new report from the Centers for Disease Control and Prevention (CDC) showing that heroin use and deaths have increased dramatically: "Heroin deaths nearly quadrupled in the decade between 2002 and 2013... Rates of abuse doubled among women and went up 50 percent among men during the same time period." Demographics of heroin users have changed, with many users transitioning from prescription painkillers to heroin, though poly-drug use remains an important risk factor for overdose deaths. New policies and practices, as well as education, are needed to curb this serious public health threat. Read more. An article form the National Forest Foundation entitled, "Pay No Attention to the Crime Behind the Emerald Curtain" highlights the serious problem of illegal marijuana growing operations in northern California's national forests. Only recently have conservation groups "begun to pull back this curtain to shed light on the reality of trespass grows - a growing environmental problem polluting our rivers, killing our wildlife and threatening at-risk species that are struggling for survival... The presence of trespass grows has risen like a slow tide, seeping through the forests and leaving, literally, tons and tons of garbage and poison behind." Read more. The good news that underage drinking and binge drinking have declined reflects in part the changes taking place among young people in their decisions regarding substance use. In a new commentary from IBH, Robert L. DuPont, MD features new analysis of data from the Monitoring the Future survey showing that over the last few decades, the number of youth who choose to abstain from all substances, including alcohol, cigarettes, and illicit drugs, has significantly increased. This finding has the potential to reshape all prevention strategies away from substance-specific health-promoting campaigns to a single focus that promotes no use by adolescents of any addicting substances. Read more.